Lenny Lamb Woven Wrap Symphony Rainbow Dark 6 (M) from Sling Spot. This is one of the most eye catching wraps we’ve ever seen; a score of music dancing across a bright rainbow that seems to be shining in the dark. It’s gorgeous! Lenny Lamb Woven Wraps are available in a wide variety of blends and weaves, always beautiful, soft, and easy to use. We can help you learn to wrap with our videos and of course in person at the Sling Library next door! Woven Wraps are perfect for a newborn baby as well as for a 3-year-old and beyond. It can be used in many different ways; the same wrap will fit people of various sizes and silhouettes. 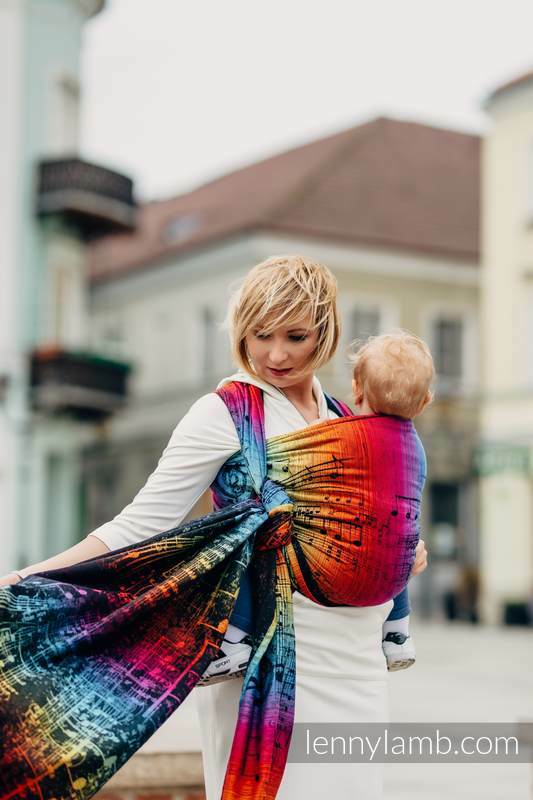 A woven wrap is always a good choice, no matter the baby’s age, weight or stage of development – all you need to do is choose the carry that will work best for you. More information about woven wraps is available on the Carrying Matters website. We have a range of Lenny Lamb wraps elsewhere on our website.